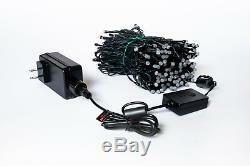 Twinkly Xmas Lights Starter Pack 105L 5MM RGB - EU 2 Pin Type C Plug. EU PLUG TYPE - USE ANY PLUG ADAPTER FOR OTHER REGION. Giving you full app enabled remote control over your Christmas tree lights via wifi, the Twinkly is the ultimate in Holiday gadgetry! It's never too early to start thinking about Christmas and the Holiday Season! 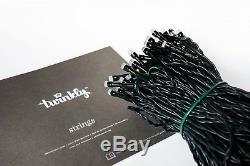 LED type: RGB string length: 10.5m+2.5m (34.4ft+8.2ft) string colour: Green. Bring your home, space, object or Christmas tree to life with these stunning LED app controlled smart lights from Twinkly. Choose from a range of animations, customised effects or even sync with music via the dedicated Twinkly app. With luxurious new packaging, more app connected features than ever, and multiple sizes available. Online effect gallery to download new effects. Playlist mode to create your own effect sequence. Social Media integration to share your creations. With Twinkly, you can choose and customize the most brilliant and sophisticated light effects ever. With continuous updates by Twinkly. 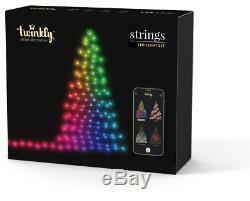 The new updated Twinkly smart Christmas lights set is now available! With luxurious new packaging, more app connected features than ever, and multiple sizes available.. SMART DECORATION FOR YOUR CHRISTMAS. Twinkly will make your Christmas even more magical thanks to colorful and bright lights, wonderful effects and a revolutionary app. Dont wait a second more, download the free iPhone and Android app now and discover the pre-made effects in the Twinkly gallery. The Layout Editor helps you fit your lights to any shape you like! The app automatically recognizes the layout youve chosen and shows the effects accordingly! Designed to fit your tree as normal lights would, but equipped with the newest RGB diffused lens addressable LEDs. Wi-Fi connection dual mode: you can connect directly from your smart device or, if desired, connect Twinkly to your home Wi-Fi network. Control the lights from the app. Smart lights recognition for precise animations: we use our patent-pending computer vision tech to understand how the lights are placed on your tree. Draw & customize your own effects. Download new and updated animations. Share your effects as animated GIF images. Physical button functionalities: press to change pattern, hold while powering up to reset. PLUG You can choose between 3 differents types of electrical outlet plugs. When we designed this technology, we started from the lights, which are not as common as you might think: every Twinkly LED contains 3 new generation RGB LEDs and a chip thats able to connect with a single string to the controller. Each light is surrounded by a protective body, specifically designed with a flat head and an opaque layer to intensify the light effects. THE ONLY APP IN THE WORLD TO CONTROL THE LIGHTS. Our designers, developers, programmers, and technicians have designed an application that lets everyone control and change the lights on the tree in a simple and intuitive way, directly from the smartphone. Through the local Wi-Fi (or the Twinkly Integrated Wi-Fi), the app connects to the controller and can manage every single LED. THE APP KNOWS WHERE THE LEDS ARE LOCATED ON THE TREE. 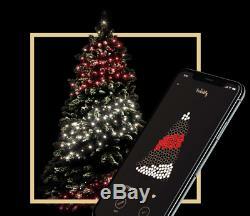 The Twinkly app is connected to your smartphone camera and can make a map of the position of each LED on your tree. This license-pending technology gives you the opportunity to create brand new effects and draw the animations directly on your device. 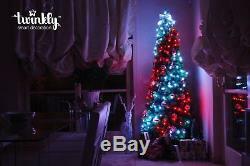 The item "Twinkly XMAS LIGHTS Starter Pack 105LEDS 5MM RGB EU 2 Pin Type C Plug" is in sale since Wednesday, October 31, 2018. 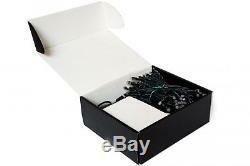 This item is in the category "Home, Furniture & DIY\Lighting\Fairy Lights". The seller is "plusmobi" and is located in Thessaloniki, default. This item can be shipped worldwide.